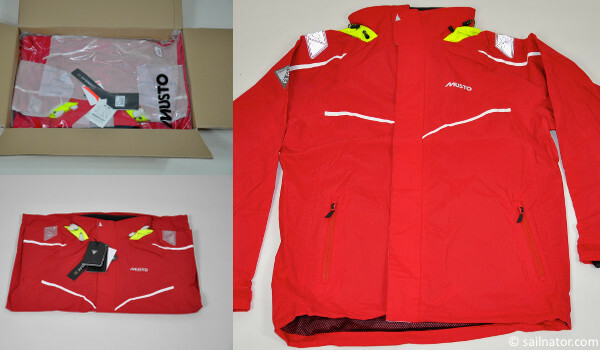 Just after two days the Musto® BR1 Inshore jacked arrived. It was well and safe packet in a carton. I ordered it in the colors red/white, but it is also available in navy/white or black/yellow. 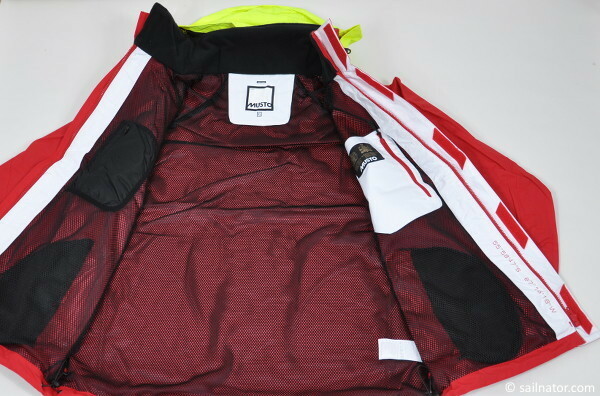 White or yellow are the colors of the reflectors that are attached on the outside of the jacket. You can find the different designs for example on the German online shop 12seemeilen.de! By trying on the jacked I just recognized how lightweight it is but it makes nevertheless a quite robust impression. The zipper is smooth running up to the top and the double storm flaps are closed with Velcro® straps above it. The jacket has a wide and straight cut so that overall trousers with a fleece or a midlayer can be worn under it comfortably. Because of that I ordered the jacket in XL size, although L size would have fitted to me probably. The jacket has a chic silhouette and I think it also makes a good impression at shore leave or even if the weather is fine. The BR1 Inshore jacket has a black mesh lining which causes high wear comfort. On the left inner side a white pocket with a zipper is located, and on the right inner side a smaller black one. There can be put all things that should stay safe and dry. Below the collar that is lined with fleece a big a fluorescent roll away hood is attached. The adjustment with the thin lines is a little bit tricky but I think when it is done once it fits for the next times too. At the back of the hood another adjustment possibility is located. So you can pull the hood a little bit backwards if the vision has been limited too much. The hood has a wide cut and it is possible to wear a fleece hat or even a ball cap under it. So you are prepared for all weather conditions. Unfortunately the main zipper ends already at the collar and the rest has to be closed by Velcro® straps. The ulterior motive might have been to keep away scratching metal from the chin. But I am not sure if this protects enough against wind and water. If the collar is closed the head is still freely movable and you don’t have to fear a stiff neck. The collar is quite high and protects the neck all around very well. As said before the hood can be rolled away and put into the collar. That can be done best when you take off the jacket. Then you get it under the cover without any buckles or folds and it becomes invisible. 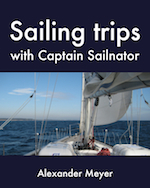 This way you can work on deck without the danger of getting caught somewhere and on shore leave it might look better too. But the collar gets stiffer with the hood inside and the movability of the head is limited a little bit. But the neck is still well protected. To get the hood out of the collar is not so easy. If the Velcro® straps are new they are absolutely secure and hinder a lot if you forget to open one or if you missed one. For that reason you have to start early enough to put on the hood if you don’t want to get wet. The ends of the sleeves are designed very smart. Inside are cuffs that can be adjusted by Velcro® straps very close to the arm. But by doing so an annoying buckle forms on the sleeve. This can be folded back by a second Velcro® strap and then the arm is well protected against spray and rainwater. Left and right on the outside of the jacket pockets are embedded. They are just so big to put a hand inside. Unfortunately the zippers of the pockets are not covered what I would have expected for a jacket of this price level. 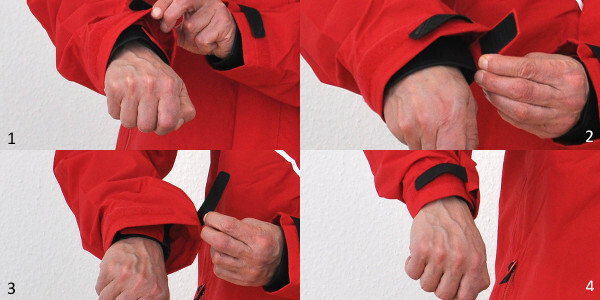 The pockets are lined with warm fleece but this is not covered with waterproof fabric to the inside of the jacket. So you might get a wet belly if water runs into the pocket or if you put wet gloves into. The zippers have a tendency to get stuck in the surrounding fabric. 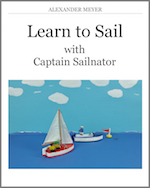 That might become dangerous if you have to get your sailing knife out of the pocket quickly. Very useful is the eyelet in the right pocket where a knife ore keys can be attached. The jacked is designed for daysailing on the coast and inshore. So it is cut relatively short which causes very good movability. The back is still enough covered, even when you bend down. But you are advised to wear the BR1 overall trousers under it if you want to stay dry in all cases. 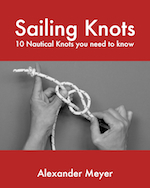 The sleeves are cut wide enough to be able to work on deck, for example at the winches. 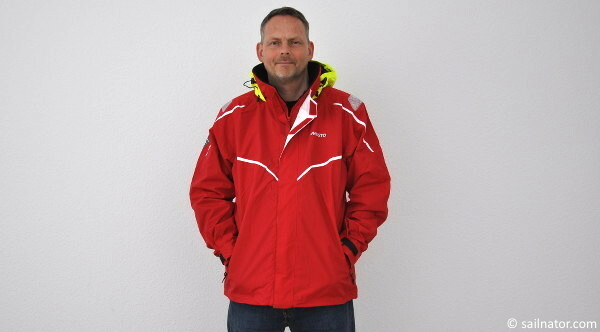 In conclusion the Musto® BR1 is a good and lightweight jacket for coast and inshore sailing. I think that is the area where most of the sailors might be found. The only negative point I found were the not covered zippers of the pockets. But if really water runs in the pockets you can protect yourself with overall trousers. In my opinion a normal sailor makes no mistake by buying this jacket.